Once more we investigate the "Whatever happened to that band?" folder in our musical filing cabinet to find Pink Cream 69. Returning just in time for their 30th anniversary, the legendary German band drops their twelfth studio album Headstrong, and with the same personnel as 2013's Ceremonial. Also, as expected, bass player and ubiquitous producer Dennis Ward handles the knobs. Additionally, as a bonus to celebrate their long career, Headstrong includes a second disc, a live recording from their hometown of Ludwigsburg in 2013. After a spin or two of Headstrong my first observation was rather simple: Pink Cream is rocking a bit heaver this time. 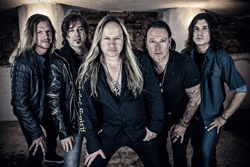 The band has always straddled the proverbial fence between hard rock and heavy metal. But, you may find the metal edge more prominent. This is especially true wtih We Bow To None, Bloodsucker, and Path Of Destiny, where the pacing borders on power metal. Even a song such as Man Of Sorrows, which seems to start as a heavy rock ballad builds into a more metalish number. Conversely, Vagrant Of The Night plays more like a true metal ballad. Beginning with voice over acoustic guitar, the tune ascends to a crescendo of sharper riffs and a later guitar solo. But Pink Cream 69 can also offer some twists, where a song turns on groove or AOR accessibility. A good example is the closing number, The Other Man, where hard rock is twisted with a latent blues groove. Moreover, arranged in another way, perhaps with some steel guitar inside, it could have been a country rock tune. Then there's the two best highlights: No More Fear and Walls Come Down. Both feature metal heaviness and some quick pacing, yet wrapped in real rock groove and embellished by fine harmonious vocals, especially in the refrain of Walls Come Down. It's easily the best song here. As for the bonus live CD, well, it's a live recording (duh), where the band is heard, the crowd not so much. Actually, the sound of the recording is nearly so pristine as to sound like a studio recording, or simply over-produced afterwards. For a "bonus" it would have been better to have a live video recording, you know, like a DVD. But that just makes sense. 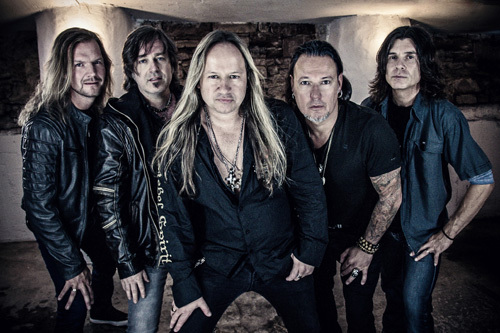 Nevertheless, Pink Cream 69's Headstrong is a fine return to form for the band, a consistent album of melodic heavy metal with hard rock groove. Nothing more, nothing less, and as expected from this talented band. Recommended. 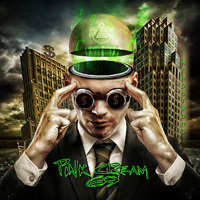 Pink Cream 69's Headstrong is a fine return to form for the band, a consistent album of melodic heavy metal with a hard rock groove. Nothing more, nothing less, and as expected from this talented band.